We stopped counting the lakes after 5 minutes. This holiday we were not very lucky with the weather. The first week there was rain. We said next week we will compensate that. That week it rain harder. So we tought the rest of the holiday will be sunny but it wasn't. Unless the rain we had a very nice journey and we adapted our self to the situation. Enough about rain. Sweden is perfect for cycling. It's big, clean and offers plenty of nice gravel back roads. Camping is neither a problem. Campings are scattered around on nice day distances in the south. 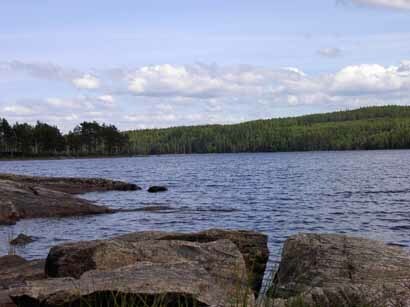 In the north (above Mora) it is more difficult I thing, but wildcamping is allowed. In Sweden we camped the first time in wild. We choose a nice spot on the map on a dead end forest road. When we arrived there we saw a perfectly nice house for rent. But no one was around we build our tent near lake next to the landing stage (pier). It was quit exciting, every minute we heared noise, may be the sound of the land lord??? In the lake we took our "shower", it was perfect. From that moment we start loving wildcamping. South Sweden is quite flat it only undulates a bit. The scenery is mostly trees and lakes. We cycled from Göteborg to Mora and than via the east side back to Göteborg.